The holidays are coming up fast! Need some help picking pens? The December 2014 Catalog #73 opens 11:00 am on December 2nd, for subscribers, and December 8th for non-subscribers. You can always browse the other active Catalogs #72, #71, #70, #69 and #68 (10% off Catalogs 68 through 70). 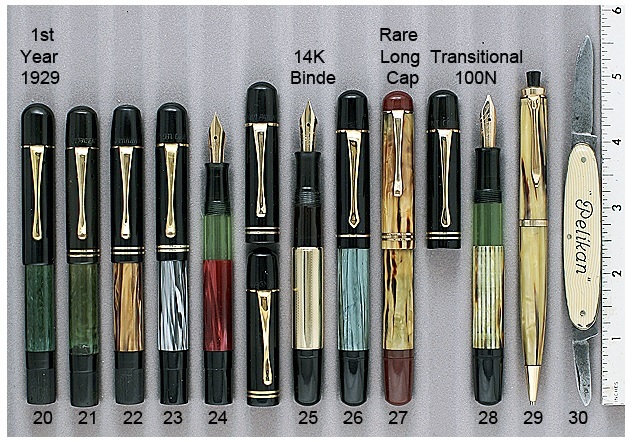 Do you like 1930’s Pelikan 100’s and 100N’s? See the photo below. Item 28, 29, and 30 are available. Have a look at the holiday colors in this tray! These items can be found in Catalog #70. Click here for more information on becoming a subscriber and getting first dibs on the catalog goods.